The excellent ArcPad Team Blog has info on the new storage format for ArcPad 7.1. Prior to ArcPad 7.1, shapefiles were ArcPad’s most common spatial file format for features. Shapefiles are great for many applications, but shapefiles lack the capabilities to support more sophisticated relational database requirments that exist in the ArcGIS Geodatabase. So ArcPad 7.1 introduced the AXF format, which we like to refer to as a “lightweight geodatabase”. As a user of ArcPad at my old job, I really hated storing information in the shapefile format. Actually I hate shapefiles, period. Any format that requires you to maintain at least 3 separate files to ensure they work is a bad idea in my book. I liked that the ArcPad team build upon the Microsoft’s SQL Server Compact Edition platform. 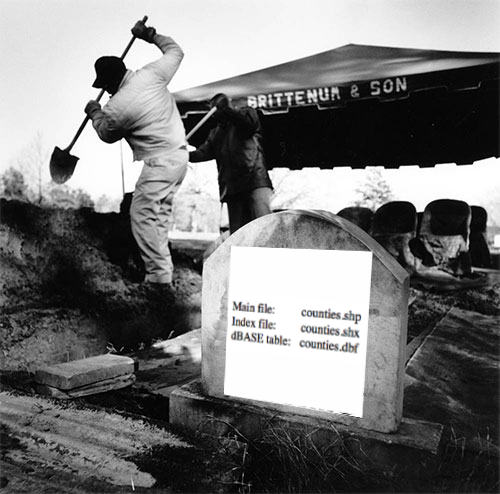 Time to bury the shapefile format!